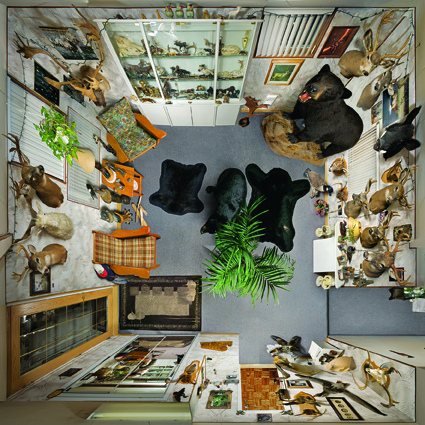 Arrangements From Life (2009) reconstructs two domestic spaces by simultaneously showing the rooms of a dwelling in all their wealth of detail. Through the use of montage and the telescoping of different views, the photographic vision of the locale creates an impossible vantage point that cancels out traditional perspective. Paiement’s optical aberrations recon- figure inhabited spaces and reveal them in a monumental mise-en-scène paired with video projections. The new work was created especially for Le Mois de la Photo à Montréal. Alain Paiement was born in 1960 in Montreal, Quebec, Canada. He lives and works in Montreal. Alain Paiement marks off a new relationship with space using large-scale photographs in which the apprehension of place coexists with meticulous attention to detail. He samples contiguous fragments of time and space, permutating them in order to compose a new vision of the real. From the 1990s on, his photographs have focused on urban architecture (Sometimes Square, 1996), family apartments (F3 (Living Chaos), 2001), and domestic space in its most innocuous manifestations (Partir d’où j’habite, 2002). With Parages (2002) and Tilt (2005), his work has evolved toward new reconstructions of inhabited space. Paiement’s installations steer the photograph toward massive mises-en-scène with processes, akin to the spatial distortions of world maps, that make it possible to recast three-dimensional reality in two dimensions. The commonly used reference points of representation — horizon line, illusionist depth, perspective and vanishing point — are cancelled out by multiple points of view overhanging the volumes occupied. Paiement has turned to cartography, which, associated with visual collage, opens the field of photography to an omniscient and radical vision of habitats in their wealth of detail. By enlarging and extending his supports as much as possible within the exhibition space, he enables the spectacular power of images to emerge. Alain Paiement’s installations have appeared in solo exhibitions (Le Monde en chantier, Galerie de l’UQAM, Montreal, 2002; Refaire surface, Espace photographique Contretype, Brussels, 2007) and group shows (The Space of Making, n.b.k, Berlin, 2005; La vie, c’est la vie: plaisir, passions, émotions, Montreal Biennale, 2002). Wednesday to Sunday, 12 p.m. to 7 p.m.; Thursday, 12 p.m. to 10 p.m.
> Artist’s talk, Saturday, Sept. 26, 2009 at 2 p.m.
Alain Paiement, Arrangements From Life, 2009. Courtesy of the artist.